An old fashioned style, this full apron will completely protect your clothing. The lined bodice is gathered to the waistband and has one button on the back neck. On most girls and women it ends at the natural waist or a bit above. The waistband turns into long ties to help you adjust the fit. The skirt is long and comes around to the middle in the back, just like a pinafore. Women's sizes are cut to be about 30" from the waist. You may request a longer skirt on women's aprons. Girls sizes are cut to be about 2" shorter than our prairie style dresses. It can be used as an apron only or worn over a dress as a pinafore. Plus sizes available on the Women's Plus Size page. Please use our size chart below to pick the best size and if possible please give us measurements. Please allow approximately six weeks for the sewing of your custom made garments. Fabric Orders are sent out weekly. Rush orders are available for a reasonable charge and order updates can be viewed at any time. 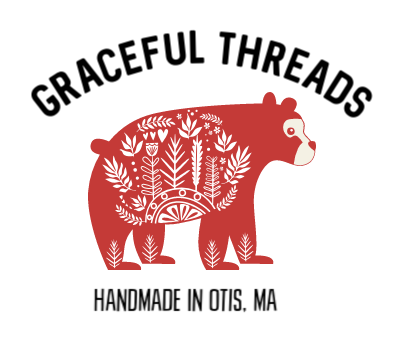 Copyright Graceful Threads. All Rights Reserved. Website Builder by 3DCart.